These are photos of some of the many people I met while traveling through Asia. Some are other travelers, while others are locals. One of the main reasons I like traveling so much is the chance to meet so many different people. I apologize to all those people I met who I did not take a photo of. 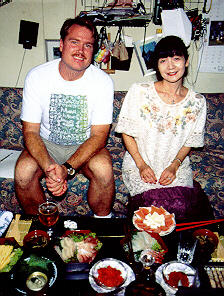 This is me with Takako from Japan. 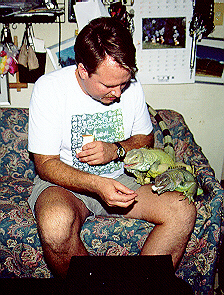 She and her husband Akira have 14 iguanas they keep in a small apartment near Tokyo. They run the Yamanouchi Iguana Laboratory. I spent the whole day with them and had a great time with them and their animals. I met Sammy and Cassy on the ferry from Hong Kong to Wuzhou in China. We endured a 9 hour bus ride on horrible roads to get to Yangshou and spend some days together sightseeing and drinking cheap beer. Although they are from England they spend the winters working at ski resorts in Colorado. Goki is from Sapporo in northern Japan. 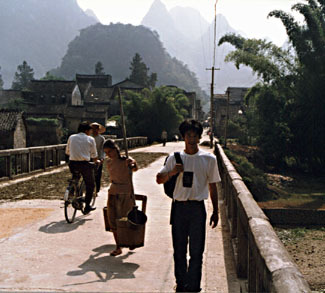 I met him in Hong Kong and then he caught up with me in Yangshuo, China. 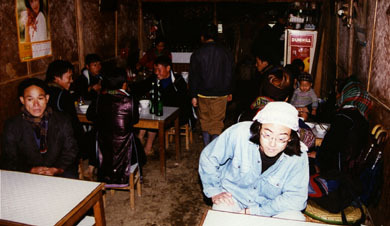 Cathy runs the Bamboo House restaurant in Dali, China. She is an ethnic Bai and is taking a break from University. She figured she could learn more English working in a restaurant catering to tourists then in a classroom. Yan Qiu is a journalist for the China Youth Daily, the second largest newspaper in China. 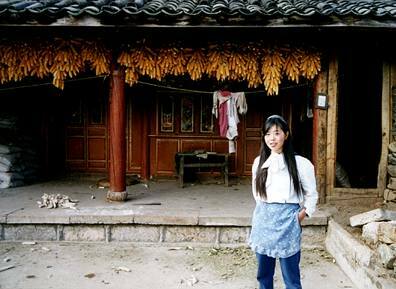 She writes for the social section and was doing a story on tourism in Yunnan Province. She interviewed me for a couple of days and we became friends. She sent me an article she wrote about me, but I can't read a word of it. I don't know this girls name, but she surprised the hell out me by speaking English when I was riding a bicycle about 30 km from Lijiang in the western part of Yunnan Province, China. She asked me where I was going and if I wanted some tea. She said she learned English on her own and didn't go to school. I was pretty amazed since she spoke better English then some of the university students I used to teach in Japan. Kenji is from Osaka in Japan. 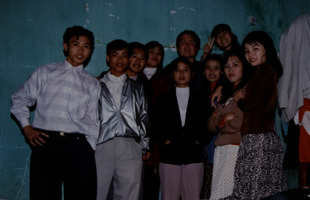 We met in Kunming, China and traveled by train to Vietnam together. I kept running into Kenji in almost every town I went to in Vietnam and also later in Cambodia and Laos. 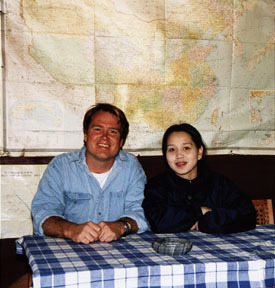 This picture was taken in a restaurant in Sapa, Vietnam. Most of the other customers are Hmong who have come into town for the weekend market. That's me with some university students from Vinh, Vietnam. I am not sure if I was adopted or kidnapped by them, but they took me around Hue for a couple of days and asked a million questions about America. This is Sun-Jung from Korea (white tee-shirt) and Connie from Hong Kong (hat). I met them just before Christmas in Saigon. 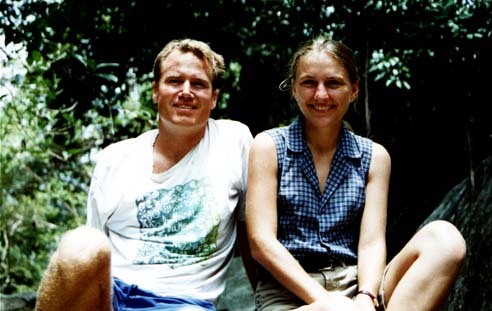 They had met about a year before while traveling in Thailand and had gotten together to visit Vietnam. On the right is a photo of us at a Christmas party given by the Dutch company Connie works for. We ended up staying up all night on Christmas eve and watching the sunrise over the river together Christmas morning. This is a poor shot (in front of van) of Dan from England . 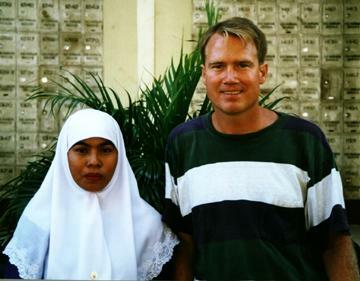 He is a photojournalist and was just bumming around SE Asia. We spent Christmas together and had a few beers. You can see some of Dans work on his homepage. If he ever makes it out of the pub he is supposed to be moving to Bangkok. This is Yoko from Osaka, Japan. 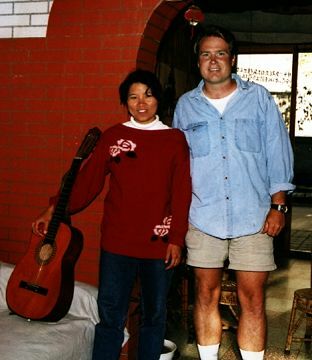 I first met her in Hanoi, Vietnam and like Kenji ran into her many times later. This picture was taken on the boat from Phnom Penh to Siem Reap near the ruins of Ankor. If my photoshop skills were better I would get rid of that shadow on her face. This is me with Su May from Kuala Lampur, Malaysia on the boat back from Siem Reap. The second picture is taken at Ankor. 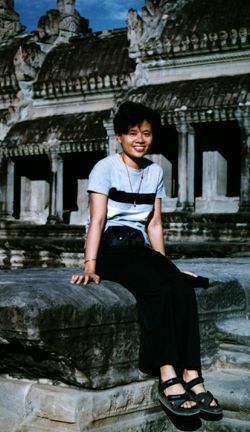 At the time Su May was on a short holiday from teaching college. 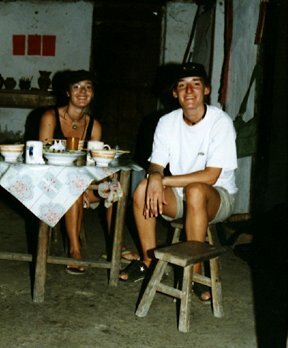 She has since quit and is currently (10/97) traveling in Nepal after having some great adventures getting to Tibet. She plans to end up in London soon and start a new career. This is Christine from San Jose, California. 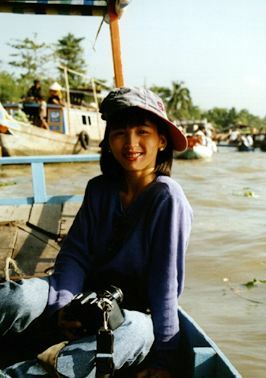 She is Vietnamese-American and I met her on a tour of the Mekong Delta region. It was her first visit back to Vietnam. This is Thomas and Andreas, a couple of Swedish guys I met in Luang Prabang, Laos. We spent a whole day on horrible bikes riding out to see this waterfall and after chartering this boat to get there found out it was a waterfall without any water. That is what we get for traveling in the dry season. If ya'll read this page before and had the mistaken impression that these guys might be from some weirdo country like Norway let me just say that they are definitely Swedish and don't you forget it!! Who are these people? Hell if I know. 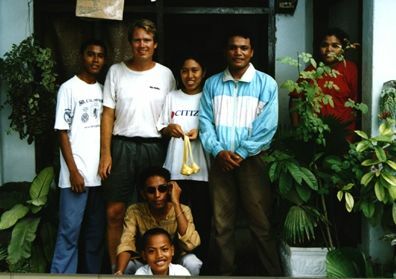 They dragged me in off the street when I was walking by their house in Bau Bau, Sulawesi Island, Indonesia. Since it was starting to pour down rain I didn't mind and the cookies they gave me were pretty good too. This is me with Any from Ujung Pandang, Sulawesi. She runs a philatelic (stamp collecting) counter at the post office there. I spent some fun times with her and her friends. 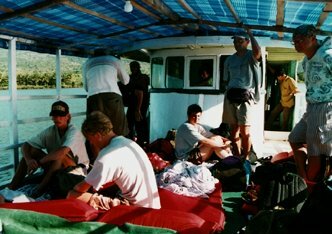 This is a shot of a boat I spent 4 days on sailing between Flores and Lombok in Indonesia. In the center is Jeff & Suzsanna from Beaverton, Oregon. We got together last summer and looked at each others photos. Jeff has some great underwater shots taken on the coral reefs we visited while on this little cruise. This may look like great fun, but for the whole trip 12 of us ate, slept, and hung out in the small space you see in this photo. This is me with Claudia from Germany on Samui Island in Thailand. 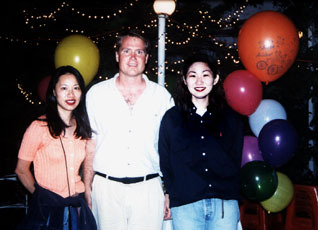 I met Claudia in Penang, Malaysia when I was on my way back to Bangkok to fly home. I ended up spending 10 wonderful days with her on Koh Samui and Koh Tao. A great ending to a great trip.